The Pembroke Welsh Corgi is a low set and long dog breed with heavy bones. It has large, erect ears; it has barely any tail (compared to the Cardigan, which has a long tail). It has a fox-like, wedged head and a broad, flat skull. 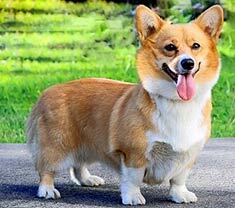 Pembroke Welsh Corgis range from 10 to 12 inches (25 to 30 cm). 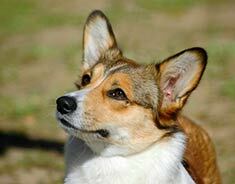 Male Pembroke Welsh Corgis weigh about 25 to 30 pounds (11 to kg); females about 24 to 28 pounds (11 to 13 kg). The Pembroke Welsh Corgi's colors can be red, sable, fawn, black and tan; s/he may also have white markings on the legs, chest and neck. The Pembroke Welsh Corgi's outer coat is thick, coarse and of medium length and s/he has a short, weather-resistant undercoat. The Pembroke Welsh Corgi is intelligent, obedient, protective and devoted to the family. Good with respectful children, the Pembroke can be a good guard dog. They can be prolific barkers, making them a good alarm dog. They don't take easily to strangers, so early training and socializing is important. Pembroke Welsh Corgis are generally a healthy dog breed. Hip dysplasia, spinal disc problems, autoimmune diseases and cataracts have occasionally been observed in the breed. The Pembroke Welsh Corgi can be expected to live 12 to 15 years. The Pembroke is a good apartment dog. Although no yard is necessary since the breed is active indoors, regular long walks are a necessity. Find Pembroke Welsh Corgi Puppies with our Free Breeder search!